Let's fend off the summer heat by travelling to the Alaskan tundra! This next game released to great critical acclaim late last year when it released on other platforms. Last week it finally hit the Wii U eShop. 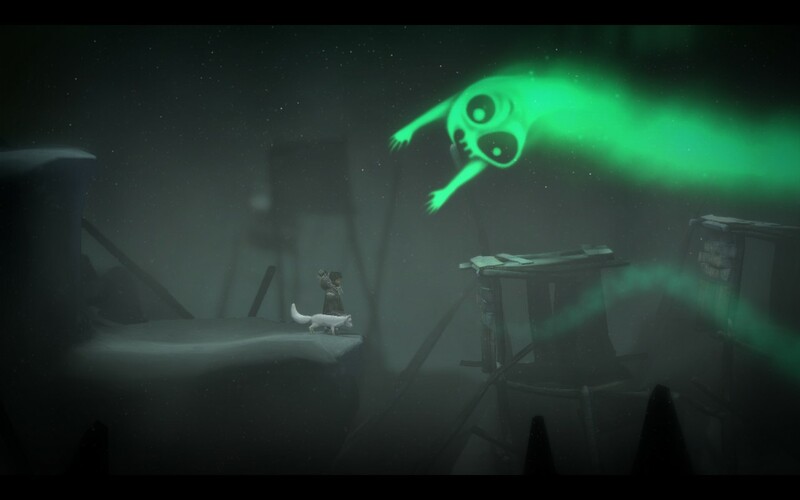 Why, it's Never Alone, and here's my review. Judging games as experiences and as art makes this hobby of reviewing games very difficult sometimes. 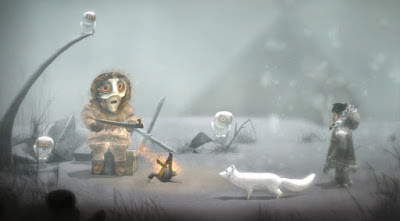 How do you put a letter value on a title like Never Alone? It vows to be more than just a game, instead offering an experience to the player. As a game, it's over all too quickly, but as an experience, it offers a rare glimpse into the world of a Native Alaskan people, rich with storytelling, history, and unique customs. Never Alone has you under the control of two characters-- a young girl from a small arctic village who marches through the frozen tundra, inside wintry forests, and even the innards of a whale is the first. The second is a playful and watchful white fox who joins the girl's journey to discover the root of a relentless blizzard that threatens the lives of the girl's village. Forget diamonds. This friendly white fox is a girl's best friend. In Never Alone, you can either play the game with one or two people. With two people playing, one as the girl and one as the fox, the game is much easier to handle. With just your lonesome playing, you use the Y button to switch between characters. Unfortunately, the AI isn't wholly intelligent. When the AI is on the ball and follows you to a "T", things work well. However, in those somewhat rare moments where the AI falls into a chasm or into a bed of spikes due to faulty logic, then Never Alone gets mighty frustrating. That said, even with the multitude of deaths that you will most likely receive while playing Never Alone, the game never feels too cheap or too challenging. Death isn't a big punishment, as the number of checkpoints available to you is immense. You'll seldom die and have to do a large portion of an area over again, and that's fantastic because dying because of the AI and having to start far earlier in the game would make Never Alone a definite "no" on the purchase list. In exchange for a drum, this gentleman gives you the Bola. As said, switching between the young girl and the white fox is performed with the Y button on the Wii U GamePad. Both characters have their own contributions to the journey. For instance, the young girl can push and pull boxes while the fox has the ability to scale walls and can summon guardian spirits to serve as platforms for the young girl. The girl gains the power to chuck a special projectile weapon called a Bola, able to destroy and interact with certain objects. By themselves, the pair can't do much, but together, the two have a wide range of abilities to solve Never Alone's simple puzzles and platforming challenges. As with any game with good design, the puzzles and platforming challenges present themselves at a slow but steady pace and build on top of one another with increasingly more difficult trials for the player. maybe a loss of five or ten seconds? In Never Alone, the young girl and the white fox will travel across blistering cold and windy plains, needing to brace themselves as the wind blows hard directly in their faces. However, the fierce gusts of wind can also be used to great effect to propel them across otherwise impossible to pass chasms. There is a sea of icebergs that must be carefully crossed, as they bob up and down on the water's surface (some into the underside of larger icebergs, potentially crushing our protagonists). Then there are chase sections where hungry polar bears and evil men pursue and hope on catching both the young girl and the fox. The entire adventure can be finished in just one sitting. 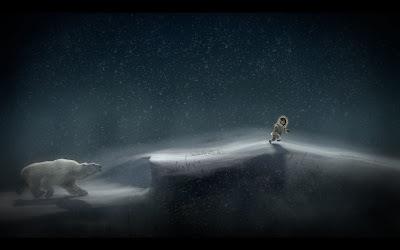 There are additional content bonuses that do make Never Alone more enticing, though. 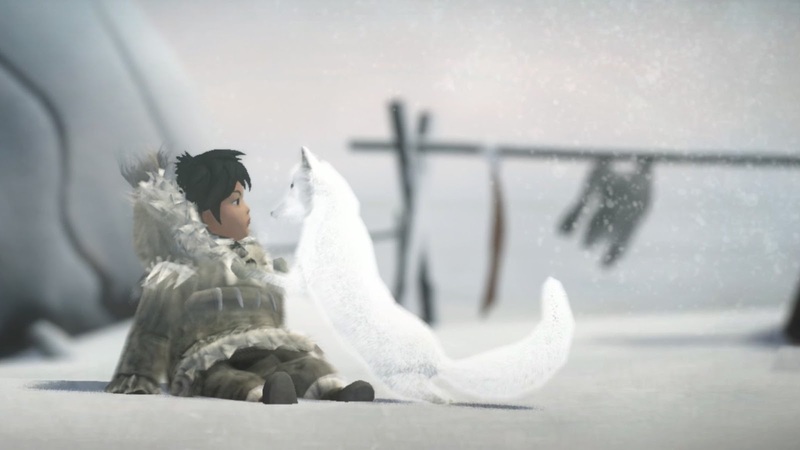 Not only is Never Alone a game, but it is also an educational and informative experience, delving into the culture and life of Alaskan native Iñupiaq people. Through coming across owls in the wild, whether through normal play or through a bit of searching, you unlock cultural insight videos, detailing a wide assortments of topics dealing with the Iñupiaq people. From myths and legends to history and customs, Never Alone offers a sizable portion of interesting reads and videos regarding the Iñupiaq people. Still, Never Alone is but a two-to-three hour game with not much replay value to it, and it is priced at $14.99. As an experience, it is highly rewarding and worth going through at least once. As a game, Never Alone presents clever puzzle and platforming design that teaches multiple concepts and builds upon them. However, it's over so quickly that there are far better ways to spend $15 on the Wii U eShop, great experience or no. Review copy provided by Upper One Games.